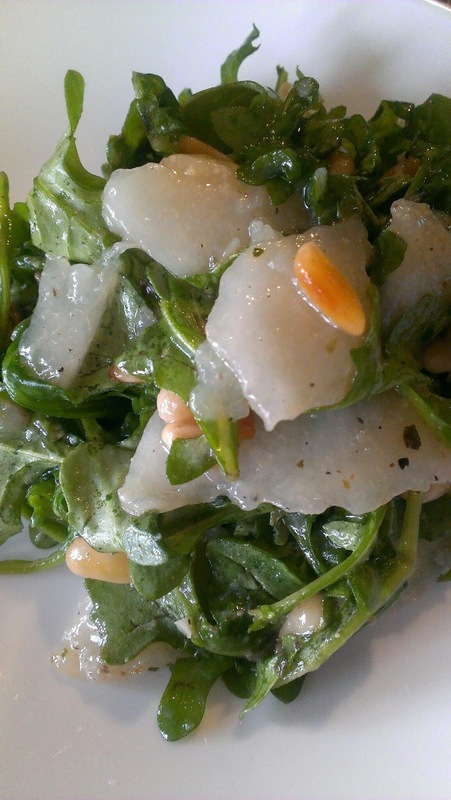 The sweetness of the pear, the peppery flavor of Arugula, the rich buttery and nutty flavor of Pine Nuts combine with a simple vinaigrette, makes this salad a great starter to any dinner. When Making Vinaigrette, remember 3.2.1 , 3=oil, 2=Sour, 1=ingredient; this standard step needs to also take in account the ingredients in your salad. 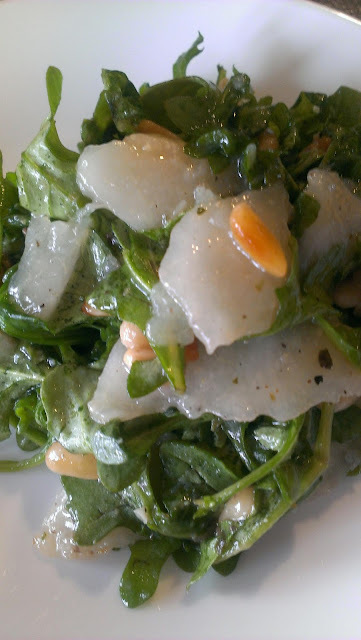 Salad Dressings as they are call they also include a sweet, which is most of the time necessary to complete a salad. We are looking for a balance in ingredients. This been said, account for the oil, sweet, bitterness, saltiness, spiciness and sourness of your salad ingredients, you will see that in many cases a sweet ingredient in the salad dressing could be replace for a sweet ingredient in the salad components. To make the vinaigrette, incorporate all ingredients, except the oil and seasonings, into a bowl and froth together with a whisk. Add the oil into the vinaigrette in a single strip and with a steady hand, while whisking from side to side until all the oil has been add it. Season vinaigrette with salt and freshly ground pepper to your taste. 2 Pears, peeled, cored, sliced on a bias. Do all the prep required for the ingredients, toss them with the vinaigrette. Transfer to a platter. Serve immediately. Alternatively, if you really have no time, pickle salad with just lemon juice, olive oil and salt are a big hit in the coasts of Italy. Make sure salad ingredients are dry, because the salad dressing or vinaigrette do not stick on a wet leave, running in the need to use extra vinaigrette, which will end up on your plates.